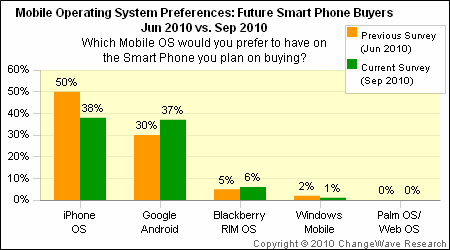 Carton reports, “As the above chart points out, we’ve seen huge leaps forward for the Android OS in four of the last five ChangeWave surveys. 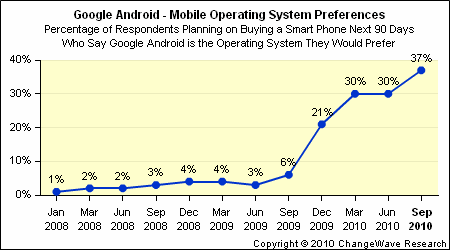 All told, it’s a six-fold increase in consumer preference for the Google OS in a year’s time. MacDailyNews Take: Wonder that it is. The complete ChangeWave report is available here. MacDailyNews Take: Apple’s approaching a crossroads that we’ve seen before where people who don’t know any better think that what they’ve settled for is “just as good” as Apple’s superior product. After all, those born into utter desolation would think a tarpaper shack is a palace. Now, with smartphones (as opposed to personal computers back when Apple last stood at this crossroads) there is far less upfront cost and hardly no cost benefit to settling for the inferior, potentially patent infringing knockoff. Also, apps that cost on average a buck or two are much less of a lock-in than they were with personal computers, where software was a real investment (this is before Macs ran Windows software natively or via fast virtualization). On top of those facts, people turn over smartphones at a much more rapid pace than they do personal computers. All of these things work in Apple’s favor for when they finally do pull the trigger and move to multiple carrier models in more countries which eliminates the main – so “main,” it’s more like “sole” – reason why people settle for fake iPhones. If you think you have to be on Verizon or your company pays for it or whatever, why wouldn’t you settle for an Android phone? It’s the best you can do. If you’ve never used an iPhone, you think you’re “satisfied.” The ChangeWave results are totally expected and not in the least surprising. Now, what happens when Apple goes to multiple carrier model in the U.S.? Well, when the time comes for their next smartphone decision, prospective switchers won’t have to pay more for Apple’s product, they will have relatively little invested in the Android platform, and they will be ready to get the real thing rather quickly. Whether Android winds up with more market share than iOS doesn’t really matter. We already know that the masses are content with inferior UI and UE and with giving away their private data. As long as iOS provides a superior experience, it will continue to be profitable for Apple and for those of us who actually care about the devices we use. Which company would you rather be today? Apple or Microsoft? Market share doesn’t matter as much as the stock market drones and Windows lemmings like to say it does. Let’s hope. I just talked to an older coworker w/ an AT&T dead spot in her apt. who has held off buying a smartphone for years in hopes of Apple “pulling the trigger” but now is planning to buy Android. As a HUGE Apple booster for over 15 years, who bought in at under $11 a share (after split), I found myself with nothing to say to her. Why shouldn’t she buy Andriod? At this point her only alternative is to just stay in the stone age indefinitely. Why Apple doesn’t just BUY Verizon if necessary to get the deal done is beyond me. So when can we replace iOS with Android on our iPads? Let’s hope. I just talked to an older coworker w/ an AT&T dead spot in her apt. who has held off buying a smartphone for years in hopes of Apple “pulling the trigger” but now is planning to buy Android. As a HUGE Apple booster for over 15 years, who buys every Apple product as soon as it comes out in order to best demo it to all those around me (having bought in at under $11 a share, i consider them investment expenses) I found myself with nothing to say to her. Why shouldn’t she buy Andriod? At this point her only alternative is to resign herself to staying in the stone age indefinitely. Why Apple doesn’t just BUY Verizon if necessary to get the deal done is beyond me. Leave it to MDN to provide some of the best and most concise analysis around – and for free, too!